Jul. 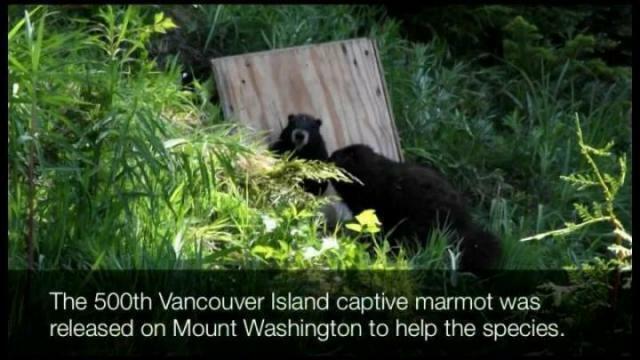 5, 2017 4:30 p.m.
Five captive-bred Vancouver Island Marmots were released on Mount Washington Wednesday in hopes of growing the species, which is among the world’s most endangered mammals. Numbers of marmots are up though: from fewer than 30 fifteen years ago to approximately 200 today. This year hopes are particularly high that the marmot’s recovery will continue. There are a number of reasons for the optimism. Overwinter survival has been excellent, leading biologists to hope that the marmots will have lots of pups this summer. Meanwhile, Vancouver Island marmots at the Calgary and Toronto Zoos have been busy too. This year marks the release of the 500th marmot from the captive breeding program, which began releasing marmots in 2003.